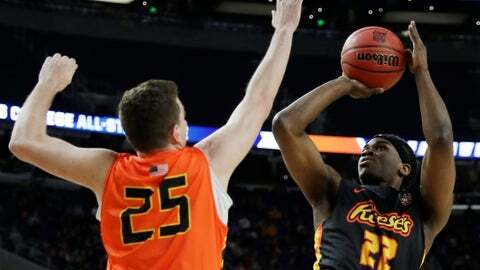 MINNEAPOLIS (AP) — James Palmer of Nebraska scored 21 points, Ahmad Caver of Old Dominion had 12 points, five rebounds and nine assists and the East beat the West 110-105 in the Reese’s College All-Star game on Friday night. The East went on a 17-3 run, capped by Georgetown center Jessie Govan’s 3-point play, early in the second half to take a 69-61 lead. The East was ahead by 15 points before Chris Clemons of Campbell took over, scoring nine points during a 14-4 run to get the West within 93-88. But the East made seven free throws in the final 1:05 to keep a lead of at least three points the rest of the way. Caver was named the most valuable player of the East. Matt Morgan of Cornell added 15 points, Devontae Cacok of UNCW had 14 points and College of Charleston forward Jarrell Brantley grabbed 15 rebounds. Clemons, who is third on the NCAA scoring list at 3,225 career points, scored 25 in being named the most valuable player for the West. Jordan Murphy of Minnesota had 13 points and 13 rebounds. Josh Sharma of Stanford had two put-back dunks and a reverse slam on a fast break in the first 10 minutes of the game to help the West build a 40-30 lead. The East missed nine straight field goals late in the first half but only trailed 53-50 at the break. Barry Brown Jr. of Kansas State led the West with 11 points as the team made nine 3-pointers and eight dunks. Palmer had a game-high 12 points at the break. The game was a showcase for 20 senior NCAA Division I players who are considered pro prospects.